I believe the Uruguayan is a psychopath. 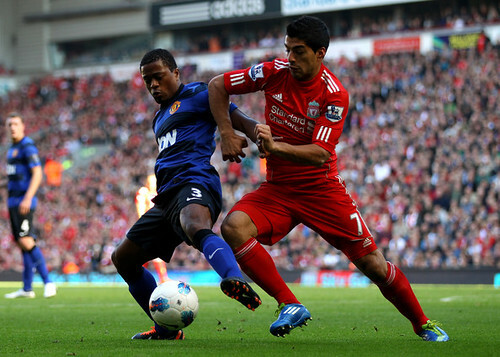 This is not a hate article, but simply an observation of Suarez’s weird behavior. There are weird people, but they’re not psychopath. Suarez is both weird and a psychopath. I maybe wrong, I don’t personally know the Liverpool striker, nor have I studied him closely. I only based this on what I read online about him. So, what is a psychopath? Psychopath is basically selfish and manipulative person, and psychopaths comprised about 1% of the total population, but it could be more. Based on my personal dealings with the psychos, and my research online, I found this site that talks about psychopathic personality, so I picked the ones that fit Luis Suarez’s antics. 1. Pathological lying – according to Brendan Rogers, Suarez was never promised that “he could leave Liverpool if it does not qualify for the Champions League”. Thus prompted the manager to punish him by training alone. 2. Poor behavioral controls – well he bit Ivanovic, which according to Suarez he did so because of desperation brought about by the team’s poor performance. Lets not forget PSV’s Otman Bakkal was also bitten on the shoulder. 3. Manipulative– He lied, prostituted himself to Real Madrid and even broke on his previous promise about staying in Liverpool just to pressure the club to transfer him to another club. Psychos love to appear themselves as victims. Remember during an interview about a month ago, when Suarez complained about the English media’s negative write ups about him, and what his family experienced inside a mall in Manchester. 4. Lack of remorse – He was involved in a number of incidents over and over again. He bit a player in the Dutch league, and he did it again in England. This shows he was not remorseful of his actions. 5. Selfish – this basically sums up the total behavior of a psychopath. Suarez does not care of what others think or even the rules. He deliberately overlooked the fans, the players and club’s support of him despite all the controversies surrounding him. 6. Greed – Although this is just a speculation, but he is probably doing it for monetary gain, a bigger salary. Psychopaths want to appear nice and proper in front of people when it comes to money. But deep inside it’s their primary aim. He said in an interview during the Confederations Cup, him leaving for another club is not about the money or Champions League, but to escape the English media’s bullying of him. Liverpool should let go of this man once there’s an offer outside of England. How prophetic this article was….wow.